It doesn’t take a hero to keep a dream alive…..You can make a difference! Paying tribute to those who have made the ultimate sacrifice. A Salute of Honor and Dignity to a True Hero! The loss of a partner, loved one, family or friend…leaves a void in our hearts forever! You must apply for a membership. 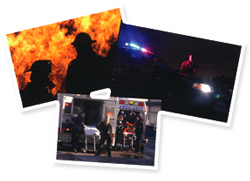 The purpose of our organization is to render financial and educational assistance to the surviving spouse and children who are left with little or no support, when a law enforcement officer, firefighter or emergency medical person loses his/her life or is totally and permanently disabled in the line of duty. time contribution of any amount. If you are looking for membership, please click here instead. This Donation Form does not provide membership. * Making a contribution allows you to post a In Memory of message above. Donations do not entitle you to membership. In Memory of message will scroll above.